French physicist who was a civil engineer in his early career, and later conducted experiments on electricity, for which he is best known. The SI unit of charge was named for him. 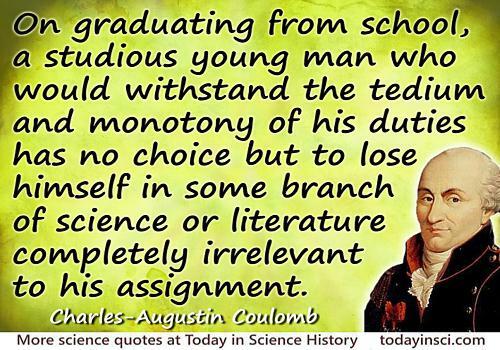 On graduating from school, a studious young man who would withstand the tedium and monotony of his duties has no choice but to lose himself in some branch of science or literature completely irrelevant to his assignment. From memorandum 'Mémoire sur le service des officiers du Corps du Génie' (1776) to the minister of war, the comte de Saint-Germain. Reproduced as Appendix C in C. Stewart Gillmor, Coulomb and the Evolution of Physics and Engineering in Eighteenth Century France (1971), 255-261. Coulomb proposed (unsuccessfully) that the corps of military engineers in peacetime engage their skills in construction of public works. As cited in Charles Coulston Gillispie, Science and Polity in France: The End of the Old Regime (1980, 2004), 530. 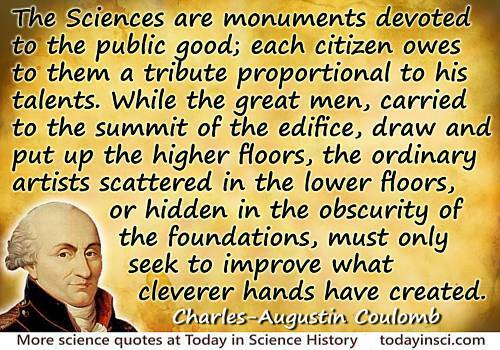 The sciences are monuments devoted to the public good; each citizen owes to them a tribute proportional to his talents. While the great men, carried to the summit of the edifice, draw and put up the higher floors, the ordinary artists scattered in the lower floors, or hidden in the obscurity of the foundations, must only seek to improve what cleverer hands have created. From Mémoires présentés par divers Savants à l'Académie des Sciences (1776), Introduction, 4. As translated in Ivor Grattan-Guinness, Convolutions in French Mathematics, 1800-1840: From the Calculus and Mechanics to Mathematical Analysis and Mathematical Physics (1990), Vol. 1, 533. Ohm found that the results could be summed up in such a simple law that he who runs may read it, and a schoolboy now can predict what a Faraday then could only guess at roughly. By Ohm's discovery a large part of the domain of electricity became annexed by Coulomb's discovery of the law of inverse squares, and completely annexed by Green's investigations. Poisson attacked the difficult problem of induced magnetisation, and his results, though differently expressed, are still the theory, as a most important first approximation. Ampere brought a multitude of phenomena into theory by his investigations of the mechanical forces between conductors supporting currents and magnets. Then there were the remarkable researches of Faraday, the prince of experimentalists, on electrostatics and electrodynamics and the induction of currents. These were rather long in being brought from the crude experimental state to a compact system, expressing the real essence. Unfortunately, in my opinion, Faraday was not a mathematician. It can scarely be doubted that had he been one, he would have anticipated much later work. He would, for instance, knowing Ampere's theory, by his own results have readily been led to Neumann’s theory, and the connected work of Helmholtz and Thomson. But it is perhaps too much to expect a man to be both the prince of experimentalists and a competent mathematician. 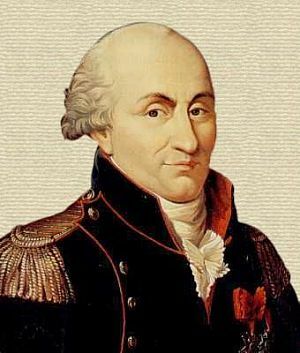 14 Jun - short biography, births, deaths and events on date of Coulomb's birth. Coulomb and the Evolution of Physics and Engineering in Eighteenth Century France, by C. Stewart Gilmor. - book suggestion.